[ACT](VC) Limit Break 4 (This ability is active if you have four or more damage):[Counter Blast (2)] Choose one of your opponent's vanguard, and that unit gets [Power]-1000 for each of your «Dimension Police» rear-guards until end of turn. This ability cannot be used for the rest of that turn. 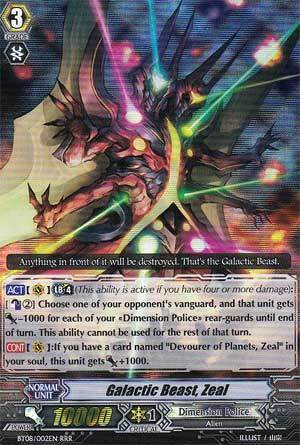 [CONT](VC):If you have a card named "Devourer of Planets, Zeal" in your soul, this unit gets [Power]+1000. [ACT](VC) Limit Break 4 (This ability is active if you have four or more damage):[Counter Blast (2)] Choose one of your opponent's vanguard, and that unit gets [Power]-1000 for each of your «Dimension Police» rear-guards until end of turn. This ability cannot be used for the rest of that turn. [CONT](VC):If you have a card named "Devourer of Planets, Zeal" in your soul, this unit gets [Power]+1000. This card is just crazy to say the least! The fact that it can potentially make you lose 5,000 power means that it forces an extra 5,000 worth of shield for each attack. Not to mention that if you use The Grade 2 Zeal's ride skill with it, the opposing Vanguard would end up losing a whopping 8,000 power which is enough to even render Crossride units to a measly 5,000 power. Not to mention that if you do complete the ride chain, Zeal will be at 11,000 power at all times, so it makes good when on the defensive as well as offense. The only downside I can see for this card is that it you can only use the Limit Break once per turn, but honestly, it makes this card more balanced because if you would've been able to use this skill more than once per turn, it would be borderline unfair especially how Bushiroad doesn't believe at stopping at zero meaning that, by some God awful miracle, your Vanguard could potentially have a negative amount of power...and that would be hilarious! In short, this card is phenomenal and can be a sleeper hit in tournaments! Next Time: Cue the Vanguard theme music because it's time for screaming Megazords!! !